Takeaway pizzas are not only typically unhealthy, but they’re also very expensive. Even freshly-made supermarket pizzas are pricey, especially if you have several mouths to feed. 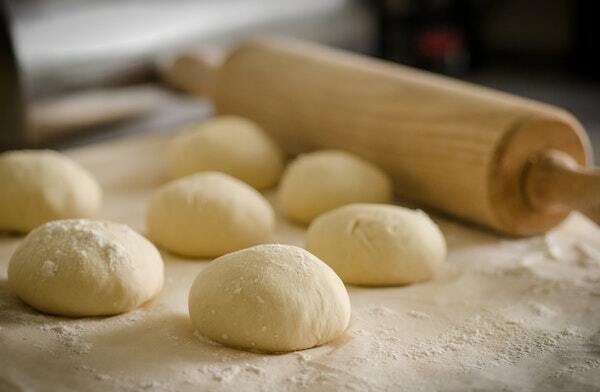 Making your own pizza dough is healthier, cheaper and can be made into a fun afternoon activity for all the family. It is also surprisingly easy and quick – the dough can be prepared in just under an hour with little effort, ready to be covered with all of your favourite toppings. Makes three homemade personal sized 7” pizzas, two 10” or one massive 20” pizza. Divide into the required amounts if making two or three smaller pizzas, and then roll with a floured rolling pin until the desired size and thickness. Don’t worry if they’re not perfectly round; it just makes them look more homemade! Just add your favourite toppings and then bake for around 10 minutes in your wood fired outdoor pizza oven on high heat. You can also add any herbs or flavouring to the dough if you wish – Italian mixed herbs, garlic and even chilli flakes work well. The dough is freezable if popped in a polythene bag, so you may wish to make double the quantity, so it’s ready to simply defrost for the next time you get a pizza craving.